The China Internet Network Information Center (CNNIC) reported that there were 79.5 million Internet users over the age of six in mainland China in December 2003. 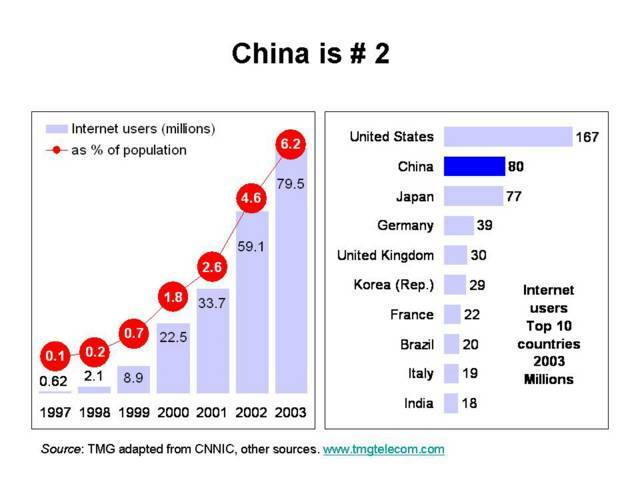 That makes China the second largest country in the world in terms of Internet users after the US. This is a ten-fold increase since CNNIC’s first survey back in October 1997 when it reported just 620’000 users. China attained its first fully functional Internet connection on 20 April 1994, a 64 kbps link to the US. Just short of a decade later, by the end of 2003, international Internet bandwidth had grown to 27,216 Mbps. It may be some time however until China catches up with the US. Based on current trends, the US will reach an Internet penetration of 100% with some 314 million users in 2012. At that time, China would have around 236 million users for a penetration of 17%. So while China’s Internet growth has been impressive, it will have to go to even higher levels to get a majority of its population online within the next decade. See CNNIC's 13th Statistical Survey on the Internet Development in China (PDF). 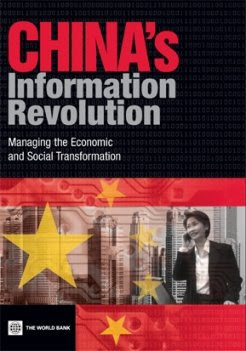 For more on China see China's Information Revolution by Christine Zhen-Wei Qiang of The World Bank.